The question is simple. What do you want to eat? The answer not so much. While one can come up with a one word answer such as Mexican, Thai or pizza, someone might go indecisive and complicated. As the the official caterer in the household, Mums have the difficult task of first figuring out what people want to eat before thinking of what to cook. When the answers are not clear or the same, I'd say the short and simple way is the best way. Take matters into your hands. Cook an easy but delicious dish then give everyone a different option on how to eat it. 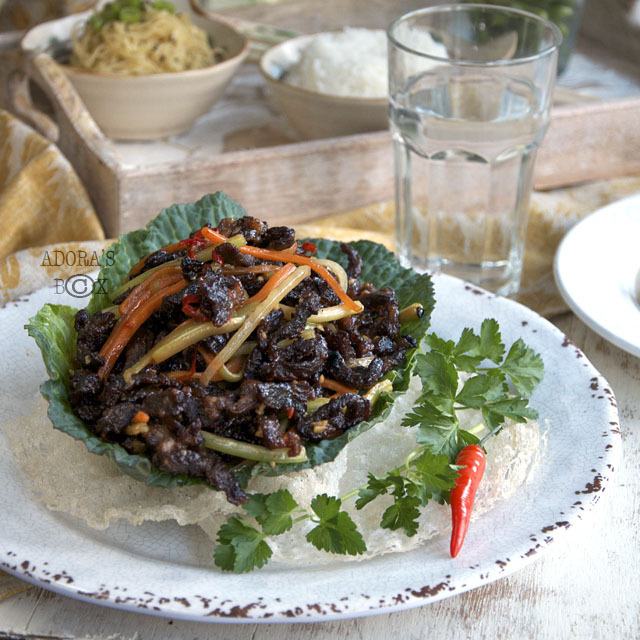 Crispy chilli beef is a classic Chinese dish that tastes so good on its own with steamed rice or with a simple vegetable dish on the side. For a more interesting meal, it can be served on top of noodles, in steamed buns or in pancake wraps. Don't just stop there. Don't feel like eating Chinese? You can eat it anyway you like such as in banh mi style sandwiches, in burrito style wraps, in noodle salads or bibimbap style rice bowls. No problem. 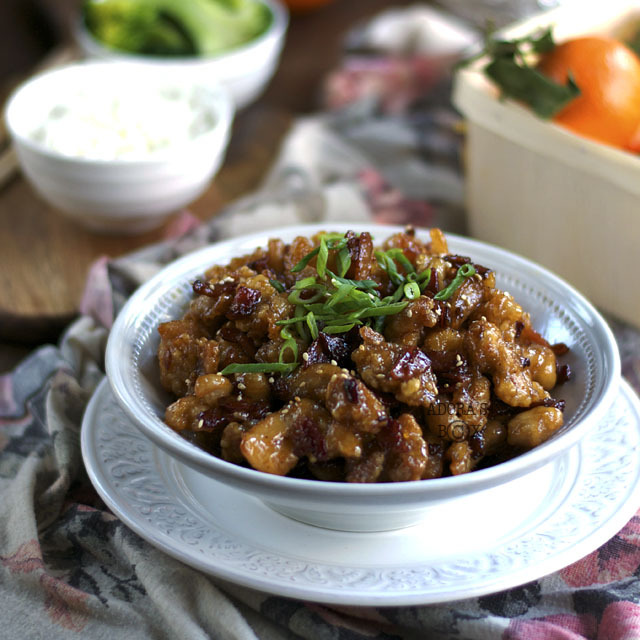 As a newly wed (ages ago), I learned to cook Chinese food to please my Chinese husband. One of my favourite cook books is Yan Kit's Classic Chinese. It is an all-in-one cookbook that discusses ingredients, techniques and recipes. I have adapted many of the recipes in this book to my liking. This recipe is one of them. 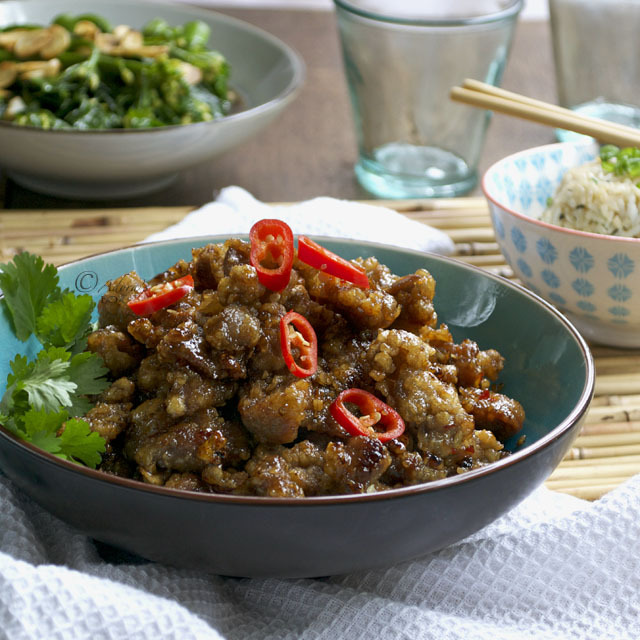 I have had crispy chilli beef in restaurants a number of times and have been disappointed as many times. Grease is the word and that puts me off tremendously. 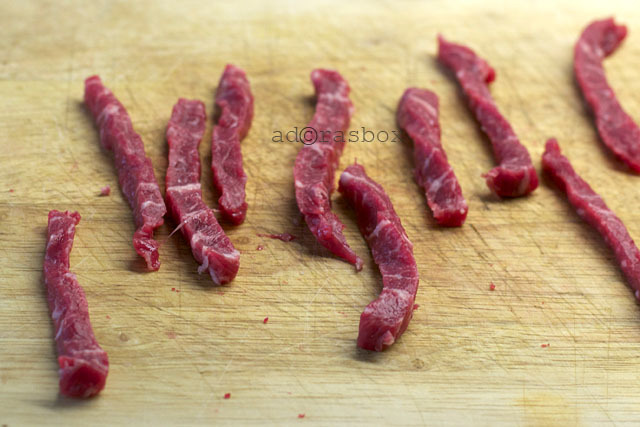 The beef strips are so thin that they are literally lost in the flour coating. That crumb/batter is meant to make the beef crispy but unfortunately too much of it just creates a good vehicle for grease (lots of it!) to cling on to. I've made a few changes to make it good enough to serve to my family meaning tasty and healthier. 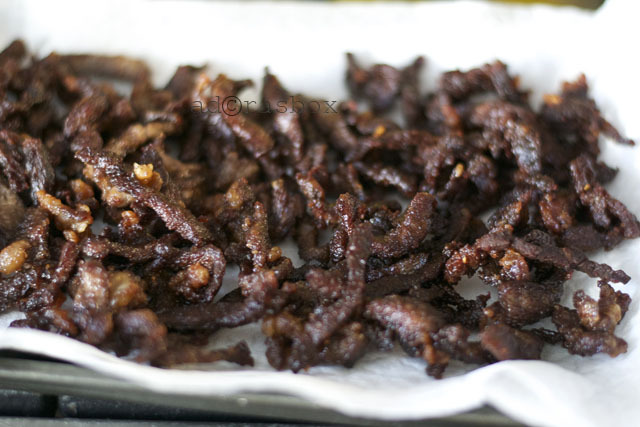 I've used just a small amount of corn flour to make the beef crispy without it losing its taste. Although this recipe involves deep-frying, I made an effort to remove as much oil as possible through straining and laying the fried beef on paper towels. I also stir fry the fried beef strips in a hot dry wok. 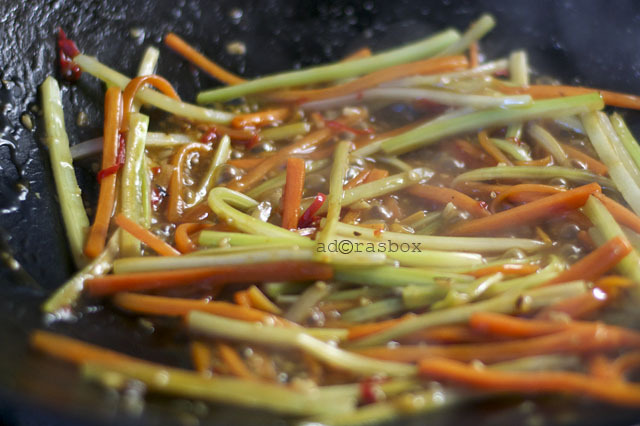 Aside from adding taste and crisping up the beef, more oil is extracted as the food hits the hot surface of the wok. A well seasoned wok would add so much flavour to this dish. 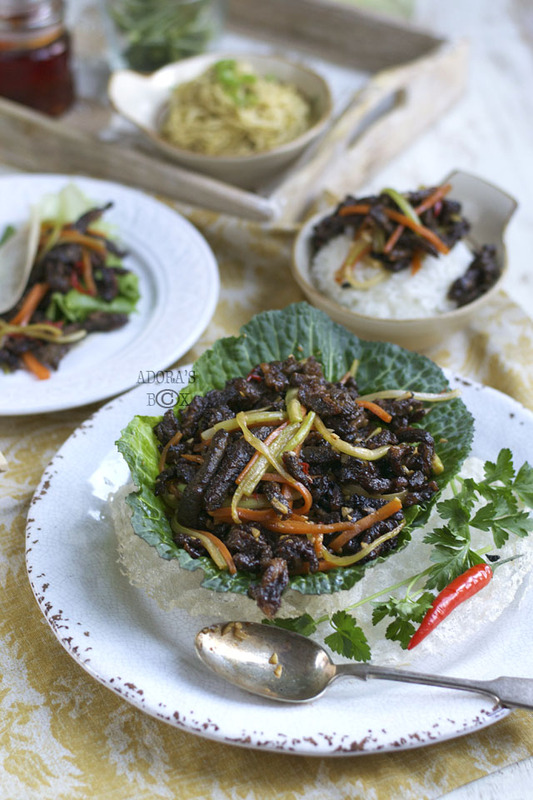 Although the crispy beef strips are the highlight of this dish, the carrots, celery and seasonings complete the taste of the dish. 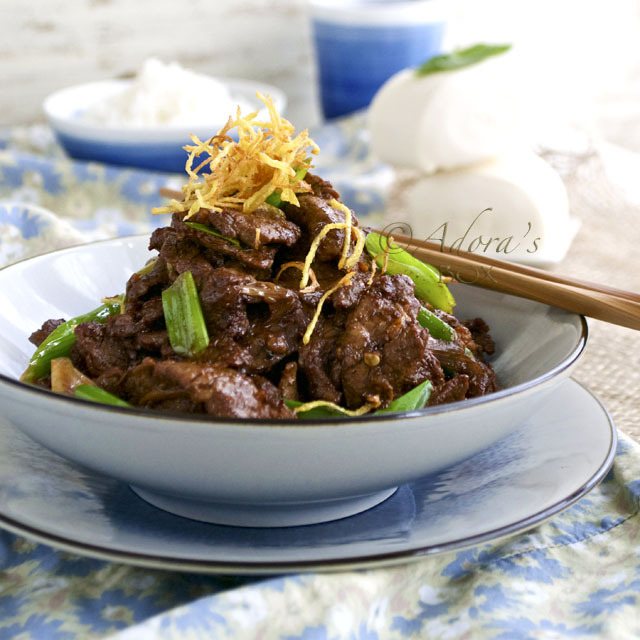 The chilli is the kicker as it gives the mild and sweet flavoured dish an exciting twist. Serve hot and eat as you wish. Everyone's happy. 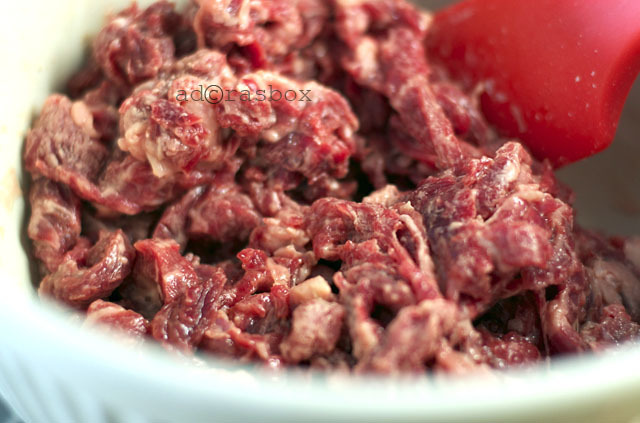 Slice the beef thinly, then into 1/2 cm. wide strips. 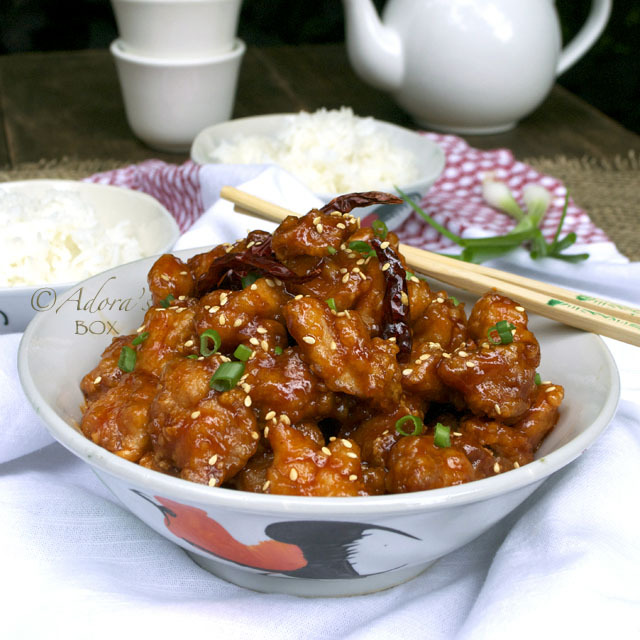 Combine the soy sauce, wine or sherry, sugar and sesame oil in a mixing bowl. 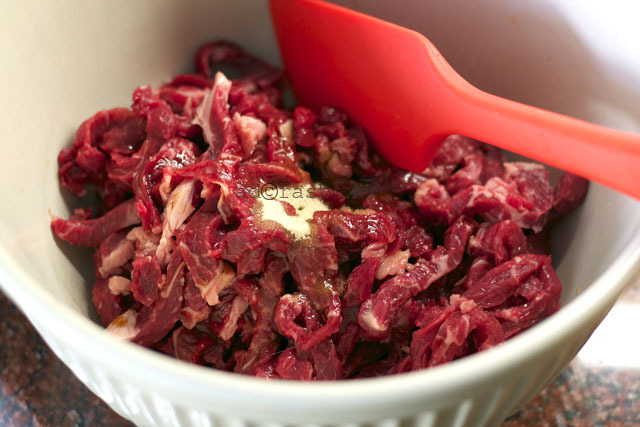 Add in the beef strips and mix well. Set aside for about half an hour. Heat up a wok and add in enough oil for deep frying. While the oil is heating up, mix in the 2 tbsps. of corn flour to the marinated beef. 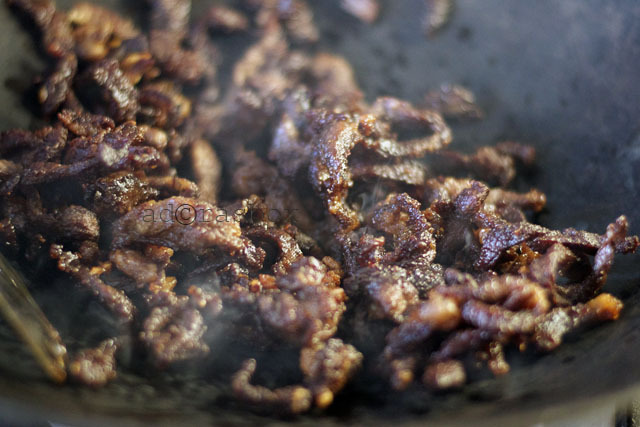 Fry the beef strips on medium high heat in batches, separating and stirring the strands as you do so. Fry until crisped, about 3 minutes per batch. Transfer to a strainer when done then spread on a paper lined tray. Heat up the wok. 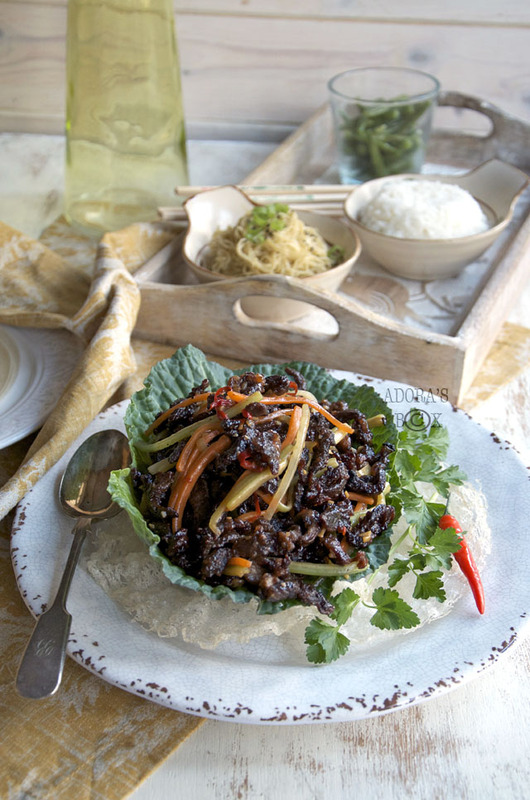 When very hot, put the fried beef strips back in and wok toss until hot, fragrant and crisp. Spread on the paper lined tray (change the paper that's been previously used). Mix the 1 tsp. of corn flour, sugar, soy sauce and water for the sauce mixture and set aside. Heat up the same wok used for dry frying the beef. There will be some oil left in but add enough to make about 2 tbsps. Add in the chopped garlic and stir fry for 1 minute until fragrant. 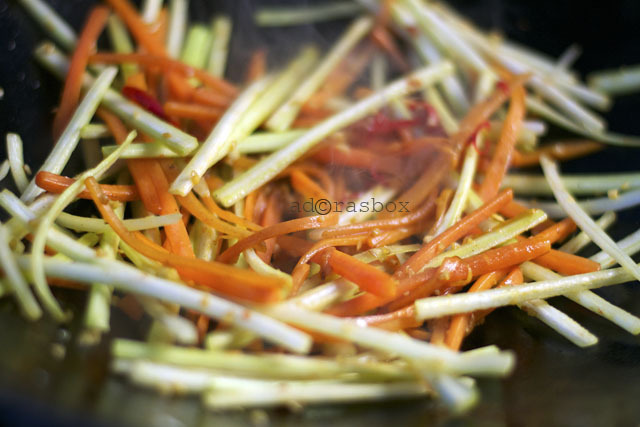 Add in the carrots and stir fry for 2 minutes, then add in the celery strips and stir fry for 1 minute. Add in the sauce mixture while stirring until thickened. Add in the ground Szechuan peppercorns and chilli oil. Add in the beef strips and stir fry until piping hot. Transfer to a serving plate. 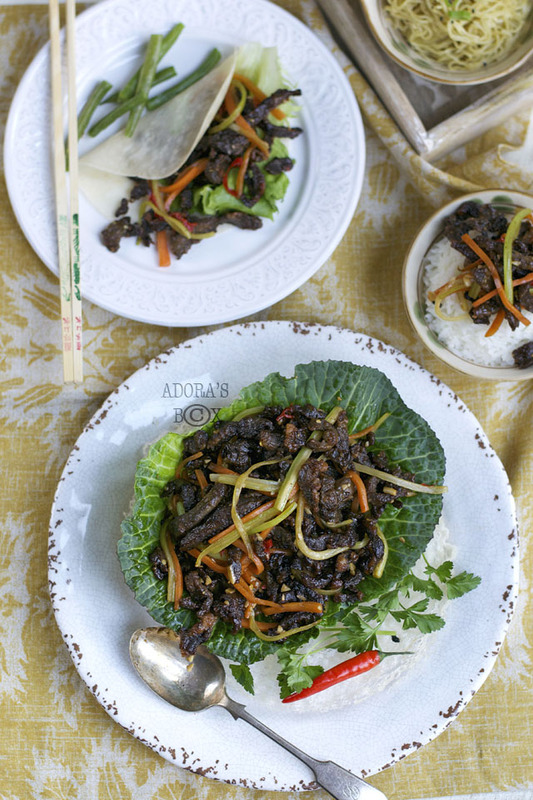 Serve with steamed rice, steamed buns or pancakes. I agree... the few crispy beefs that I've order in restaurants are usually quite greasy. Yours looks perfect! Love this meal! Thanks Adora!